The Lead A1 aims to condense the most playable elements of the Nord keyboard range into a single instrument. When it was announced last year, the A1 virtual analogue polysynth (the eighth to bear the Nord Lead name) not only followed hot on the heels of the Nord Lead 4, it just about trod on them. Sure, there were to be a further few months before it became available, but it was still a surprisingly short period between the launches of the two. Superficially, the models look similar, although a closer look reveals that the A1 is smaller than the Lead 4. Both are based around a 49-note, velocity (but not aftertouch) sensitive keybed; both retain Clavia’s pumice mod wheel and wooden pitch-bend stick; and both sport the distinctive, and still smart, Nord livery. 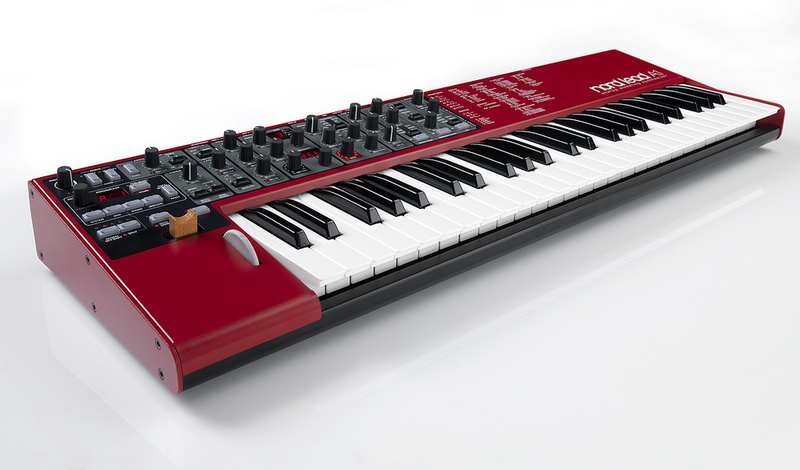 Both also retain the four-part voicing of previous Nord Leads and, although the polyphony has increased by six voices on the new model, the memory remains much the same, and things such as MIDI and USB are common to both, as is their ability to take advantage of the Nord Sound Manager, which allows you to organise their memories as well as save and reload sounds using a Mac or PC. But when you look more closely, you’ll see that there are fewer controls on the A1, and these point to many significant differences in their voice structures. Nowhere is this more obvious than in the oscillator section. Although the A1 produces 47 initial waveforms (including analogue-type waves, tines, bells, clavinets, drawbar organs and vocal formants) and offers eight ‘unique Oscillator Configuration Shortcuts’ that include detuned dual oscillators, hard sync via a hidden oscillator, AM and FM amongst others, it has just three controls for all of these options; one to select the configuration, one to select the wave and one to control the chosen configuration’s single parameter. Many years ago, Clavia introduced a similar system on the Nord Stage, so I asked Hans Nordelius, the designer of the Nord synthesizers, whether this was pertinent. He explained, “The A1 was born when I was approached by one of our beta-testers, a musician in Sweden who is forever doing live shows and touring. He always uses Nord Stage keyboards, and told me that the best synth for him is the one contained in the Nord Stage 2 because there are many occasions when he has little or no time to prepare before a show. He said, ‘The Stage 2 synth is the fastest ever, and if I have a request for a specific sound I can tweak it very quickly. Could you build a synthesizer like the synth section in the Stage 2?’. This pushed some buttons in me. When we look at the synths from the 1970s, we love them even though they have a lot of limitations, so I went back to my personal favourite, the Prophet 5, and started thinking about the ideas that led to the A1.” So that’s a ‘yes’, then. The filter section returns more closely to the Nord Leads’ standard architecture and, although there’s only a single filter available at any given time, this can take the form of a VA recreation of a Minimoog or TB303 filter as well as standard 12dB/oct and 24dB/oct low-pass filters, a high-pass filter or a band-pass filter, all with a claimed frequency range of 14Hz to 35kHz. Most of these modes will self-oscillate at maximum resonance when a signal is applied to kick them into life (which is a bonus, because the filters in previous Nord Leads could not) and overdrive has been retained, although the 48dB/oct LPF from the Nord Lead 4 has been discarded, which is a shame. Clavia claim that the ‘M’ and ‘TB’ filters model the resonant response of the original, analogue filters. I can’t speak for the accuracy of the latter, but the Minimoog filter is not quite correct because the characteristic decrease in resonance with decreasing pitch is not evident. It’s a nice, smooth filter, but it’s not a clone of the Minimoog. The Minimoog’s tracking system of Off, 33, 67 and 100 percent is used for all the filter types, which is adequate for most purposes, but more surprising is the filter’s contour generator — or, rather, the lack of it. If you want to shape the tone of a note dynamically using the filter you have to employ the three-stage Modulation Envelope, which offers ADR and ASR options, but not ADSR, let alone some of the more esoteric contours found elsewhere. On the positive side, the time constants are long — up to 45s — which makes it possible to create much gentler sweeps than is often possible. The contour affecting the audio amplifier is also an ADR/ASR device, which again demonstrates how much of the A1 was derived from the polysynth in the Stage series, and this is further reflected in the provision of just a single, sync’able LFO. That’s not one-per-voice, that’s just one for the whole instrument! With just five waveforms and two destinations it’s incredibly limited by modern standards although, perhaps by way of compensation, it can also be used as an auxiliary, polyphonic contour generator. Happily, as on previous Nord Leads, you’ll find a secondary, dedicated LFO that provides vibrato and delayed vibrato. Its range is limited and you have to set it up globally in a menu, but it’s nonetheless welcome. If there’s one area in which the A1 clearly trumps its predecessors, it’s in its effects section. Whereas the Nord Lead 4 provides esoteric effects such as ‘crush’ and ‘talk’ alongside its overdrive, comb filter and compressor, the A1 offers the more useful selection of an MXR-type flanger, a MuTron-based phaser, a stereo chorus, and a stereo ensemble based upon the Eminent/Solina effect, plus ring modulation and overdrive. Furthermore, whereas the Nord Lead 4 can generate reverb or delay but not both at the same time, the A1 allows you to invoke both as you choose. The amount of control is still limited when compared with dedicated units, but the effects work well and you can now create all manner of sounds that were forever beyond previous Nord Leads unless you used external processors. Next, there’s the A1’s dedicated arpeggiator. This offers a range of up to four octaves and the usual up, down, up/down and random modes. The Nord Lead 4’s poly mode and its patterns have been discarded but, given the A1’s simplified approach, this is perhaps a good place to reduce complexity. Likewise, the A1 offers mono or legato modes for monosynth duties, with or without portamento, but you can no longer choose the note priority, which is a shame. On the other hand, the unison function has survived unscathed, and Clavia claim that this is a significant improvement over previous versions. There are three options: two or four mildly detuned and panned voices, or four moderately detuned and panned voices. None of these appear to eat into the polyphony, and I could find good uses for all three. As before, the A1’s morphing capabilities allow you to change multiple parameters within a sound using the mod wheel, the expression pedal, velocity and MIDI CCs 01 and 11. Setting up a Morph within a Program is straightforward, and this is the means by which (for example) you can use the expression pedal to control filter sweeps, even though there’s no direct way to assign one to the other. There are 22 parameters per Program that you can attach to the controls, which is significantly fewer than the 57 offered on the Nord Lead 4. However, you appear to be able to select all of them simultaneously instead of being limited to defining just seven destinations, which is a big improvement. Unfortunately, the A1 has lost its predecessor’s Impulse Morph system which, amongst other things, allowed you to create up to seven variations of a sound within a single Program. Mutation sounds scary, but it’s just a way to create quasi-random variations of the current sound. If you invoke it multiple times, each new version is based on the original, which is a nice touch. In contrast, Randomising creates a new sound without reference to the existing one. I often find these functions to be a bit too hit-and-miss for my tastes, but the A1 has an unexpected trick up its sleeve: you can use the mutated or randomised sound as the far extreme of a morph, then use the morph controller of your choice to slide from the original to whatever result the synth has created for you. I like this. As is standard on Nord Leads, an A1 Performance is four-part multi-timbral, with Programs (complete with their effects) allocated to Slots A, B, C and D, which can then be split into upper and lower regions, layered, and soloed. However, there’s now a useful Multi Focus function that allows you to adjust the parameters in all the Slots simultaneously. That’s a neat trick. Given that the A1 is truly multi-timbral, it has a great advantage over synths that have to compromise when allocating effects in their Performance or Multi/Combi modes. With independent MIDI channels for each Slot and independent (though monophonic) audio outputs for each when used in this way, you can even treat the A1 as four separate synthesizers, provided that you do not exceed its maximum polyphony. Alternatively, you can create complex, interacting sounds by layering the Slots and then synchronising the LFOs, arpeggiators and delay effects in each of the Programs to a common master clock, whether generated within the A1 or derived from MIDI. This is all good stuff. The first time I played the A1, I was startled by the lightness of its unweighted keyboard and, in a strange way, I found that this encouraged me to programme vintage synth sounds — the type of monosynth patches and early polyphonic sounds that we all used in the 1970s. Certainly, I wasn’t going to attempt to play any form of piano sounds on it; despite its velocity sensitivity, it just wouldn’t have felt right. But for fast, responsive, synth-y duties, it works well, although you may feel that a four-octave keyboard is a bit parsimonious on a 26-note, four-part multi-timbral polysynth. Keeping things simple and compact, the Nord Lead A1 measures 800 x 260 x 90 mm.Now, what of the sounds themselves? I’ll be honest, when I first started to program the A1, I was less than totally impressed. For example, when I want to create a patch using two oscillators, I like to be able to reach for the waveform, tuning and modulation controls on each, and then mix them in a mixer, not select between configurations to find one that offers the closest approximation to the combination of features that I want. But, as I experimented with it, I found myself crafting a wide range of high quality patches on it, and I was soon discovering sounds that I had never obtained from a Nord Lead before. It was hard to be analytical in my programming; you can’t easily say, ‘I want a sawtooth of one pitch here, a detuned pulse wave of another pitch there, one modulation applied like this, and another modulation applied like that,’ because that’s not the way that the A1 works. Indeed, there are some common sounds that you can only obtain if you layer a couple of Programs using the Slots and, even then, there are limitations. But, once I stopped worrying about what it can’t do and concentrated on what it can, the A1 lent itself to a serendipitous style of programming, and tweaking knobs here and there led to some unexpected and rather fine-sounding results. By the way, I have read elsewhere (and fear that you may have done likewise) that the A1 has no pulse-width modulation. That’s just ignorant: select the pulse wave and you can modulate it using the LFO in the usual fashion. But that’s not to say that it’s without other limitations and, for me, its biggest problem is its lack of aftertouch. Sure, the Nord Lead 4 is also unable to generate it, but at least it understands aftertouch over MIDI, so you can circumvent the problem by playing it from another keyboard. The A1 does neither. The other two things that frustrate me are its lack of a proper screen and the continuing omission of a modern patch selection system. Scrolling through hundreds of sounds is a pain in the backside and, without the Sound Manager, you have no idea what each location holds unless you write a list or are prepared to play a few notes as you step through each. If there’s to be a Nord Lead 5 or an A2, I hope that Clavia will address this. If you’re expecting the A1 to be Clavia’s most sophisticated synth to date, you’re going to be disappointed. (The Nord Lead 3 still holds that honour by a large margin.) Instead, it’s a marriage between the simplified synth in the Stage series and the Nord Lead 4. If there’s a good side to this (and there is) it’s that its unusual structure encourages experimentation, leading to sounds that, while possible on previous Nords, were less likely to be discovered. What’s more, the underlying quality of the sound is undiminished. I might even venture that in some respects it’s better than ever; the more I played the A1, the more I realised that it’s a super little synthesizer, although it’s not one that lends itself to extreme, off-the-wall sounds or effects. Nonetheless, despite being more affordable than the Nord Lead 4, it’s still not a low-cost instrument, and it remains more expensive than alternatives such as the Roland Gaia and Novation’s Supernova II spin-offs. I’m happy to justify that by reminding myself that it can be used as four independent and rather fine-sounding mono/poly VA synths in a single box, each costing as little as £300$500, but you may not wish to accept omissions such as the lack of a screen or the lack of aftertouch at that price. With that in mind, I’ll make the unusual decision of offering the penultimate word to the man who designed it. Whether the A1 proves to be a success or not, Clavia are to be commended for trying something different. Clavia have retained the Nord Lead 4 alongside the A1, so which should you choose? If you want the additional flexibility offered by the Nord Lead 4 and appreciate that you can at least use aftertouch over MIDI, put this at the top of your list. Alternatively, the improved effects on the A1 make it much more immediate, smoother and more polished, especially when programming ensembles, pads and carpets of sound. If that makes it sound a bit like a modern-day Juno 60, it’s not an altogether inappropriate conclusion. Oh yes, and it costs around £200$300 less too. The A1’s most obvious competitor from elsewhere is possibly the KingKorg. This offers far more filter types, more modulation options, a wider range of effects, a vocoder, CV & Gate outputs, proper displays, a 61-note keyboard and increased polyphony. On the other hand, the A1 has greater multi-timbrality, and several programming and performance features that the Korg doesn’t. Hmm... that doesn’t sound as if they’re direct competitors, does it? But I suspect that many players would use them for similar jobs so, if you’re interested in one, I recommend that you check out the other too. If you fancy the A1 but don’t need another keyboard, the A1R provides the same sound engine but omits the keyboard, pitch-bend stick and modulation wheel. Costing £200 $300 less than its sibling, it can be used as a desktop module or, with the optional ears attached, inserted into a rack. The rear panel of the A1 is a fairly spartan affair, with four quarter-inch audio outputs, a stereo headphones output that carries the signals directed to outputs 1 and 2, MIDI In and Out on five-pin DIN sockets (the latter of which can act as a ‘soft’ Thru), USB for MIDI but not audio, and two pedal inputs, sustain and expression, the latter of which you can direct to Morph and Volume only. Finally, there’s an IEC mains input. There’s nothing in the manual to state what mains sources are accepted, but the plate on the synth states 230V, 50/60Hz. This suggests that there may be a separate model for 100/120V markets. If you’re using the USB connection with the Nord Sound Manager software, your Mac will recognise the A1 without further ado, while your PC will require a driver that you can download from the Nord web site. The new ‘Like’ button allows you to save up to 50 temporary edits while you’re experimenting with your Programs. If you then find that you’ve taken a wrong turn, you can step forward and backward through the list until you find a version that puts you back on track. It’s much the same as the History feature in software such as Photoshop, and a useful bonus. The new VA engine sounds at least as good as earlier Nord Leads. It has a greatly improved effects section. It’s truly multi-timbral — four synths in a single instrument, if you wish. It feels solid, but is light enough for your 10-year-old daughter to carry around safely. It has limitations when compared with a conventional VA synth engine. There’s no aftertouch, and no screen to aid programming or sound organisation. It takes a while to get used to the unusual parameters. The USB connection doesn’t carry audio. Like some of the most revered synths of yesteryear, the A1’s whole is significantly greater than the sum of its parts. Clavia are to be applauded for trying something new in a market replete with conventional VA polysynths, and it will be fascinating to see whether the company pursues this direction further.